Do you want to hear about something really amazing? Ok, you already know I how much I love our town, right? So far, I’ve written several stories about how nice the people here are. ﻿Kindness Noticed is about the time my son was crying while we were standing on a corner at a closed business in town and someone opened a door. When Those Hats Came Full Circle is about walking into a store in town and realizing we are right where we’re meant to be. In Welcome Wherever We Are, I tell about a local store owner that lights up this world with her smile. Oh, and in Stumbled, it was because a local business extended my bill when our money was short, that I included that as a gift of Fate. There’s something new I want to tell you about that you’re going to love! Recently, a gal saw Community Art project in another town, so she started it in our town. The premise is simple. Decorate rocks and them hide them around town for others to find. It’s sort of like a giant Easter egg hunt, but with art! How awesome is that? We met friends at a park on Tuesday and hid some. Later, on the project’s Facebook page, someone posted a picture of our rocks that had been found! Local businesses are even joining in and giving prizes if their rocks are found and brought in to their business. I absolutely love this idea, especially since the town pool closed several years ago and the new one isn’t built yet. This gives everyone something fun to do on a summer’s day. Also, it’s open to everybody, any age, and any artistic ability. Once a rock is found, it can either be kept, or hidden again. Isn’t that neat? See the ones in the pictures? We made those and we’re going to hide them today. Aren’t they are cute? We decoupaged the small ones, then painted the dots. 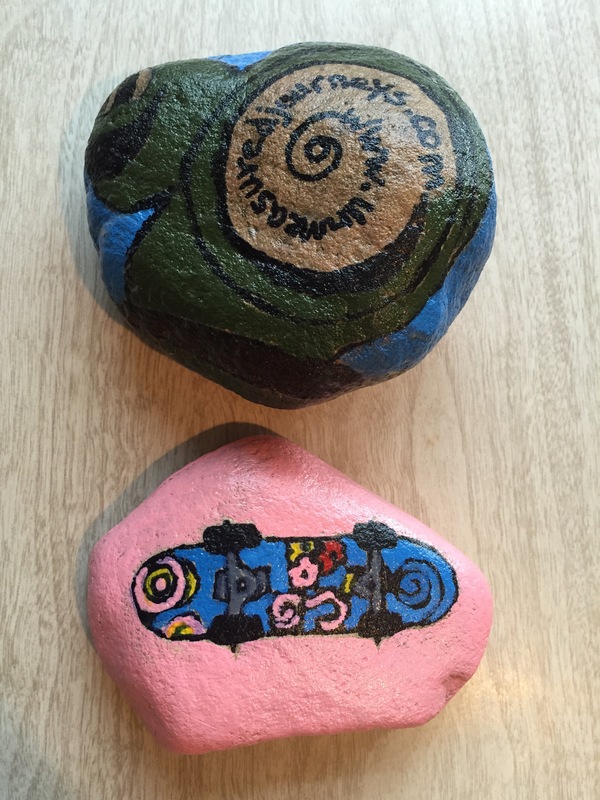 I drew the snail and skateboard onto the other rocks then painted them. We’re pretty excited for someone to find them! This is just another reason why we love it here. How fun to live in a place where even the rocks rock! Ohh…Love it Jessica!! Thank you for sharing!!! Isn’t it the neatest thing ever???? Jessica, I want to move to your town! !😀😀 what a fantastic sense of community spirit. The stone treasure hunt sounds wonderful and such fun for all ages – and I can imagine how chuffed your were to see your stones found on FB. They’re lovely! Many more happy hunting weekends to you and the town! Aw! Thank you, Karen. You’re right. It reminds me of those pictures of neighborhood picnics from the 1950’s. Ahhh, how sweet and fun is this? What a wonderful place your town is! Wish you would’ve been with us today when we hid them. We found some, too, and it was so great! What’s really great is, there is this nature park in town that hardly anybody ever went to, until now. We’ve been there before and have never seen anyone. Today at least 6 families there looking for rocks. 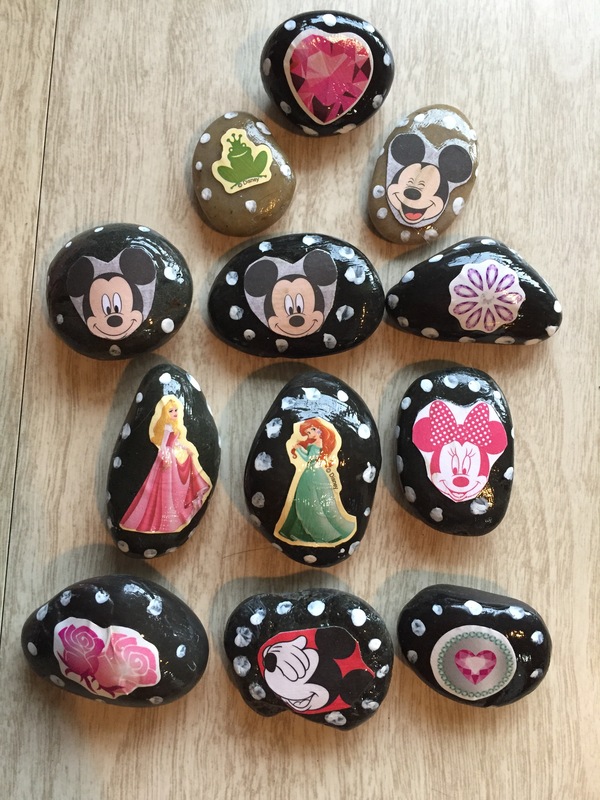 I just read your latest post – all the pics make the rock hunt look like it should be something permanent. It could become ‘a thing’. They could call it the rockolympics! Oh!! You are brilliant!! “Rockolympics” That rules! What a great idea – your town rocks! Thanks for the story and for visiting my blog. Thanks Jessica. I applaud your enthusiasm. Good ideas spread like wild fire. Wow! Thank you, you’re super kind! We sure do! :) We hid ours yesterday and found some as well! I think I’ll post pictures! Hi. We’re making more today. It is so much fun. I love the idea of sharing a bit of artistic expression. Here’s something SO amazing. Our town has like 6000 people. Well, over 3000 people have joined the project’s Facebook page!! Talk about community. People are posting pictures every time they hide or find rocks. Such joy!